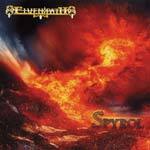 After three demos, Spyrol is the first album from the Frankfurt based german band Elvenpath's first album. It is self-released and bare the same title as their prior demo (2007). The band started in 2001 and my first acquaintance with them was their second demo Gateways in 2004, and I heard potential in the band even if they had a long way left to go. The music is a mix of heavy metal and power metal, often in the eighties vein, and the opening track here, Burning Skies, is eighties metal to the bone. In addition, Burning Skies has a clear resemblance with Gamma Ray in the chorus. The second track Priests Of War carries on with a hint of the eighties and I hear a lot of early Hammerfall in the sound here. And add a touch of Iron Maiden in the rhythm guitars and also Stormwarrior and you get a decent song. I do not know if that much has improved since the last time I heard Elvenpath, the twin guitars still work excellent, but the band has definitely become a more tight unit. When I come to The Mask Of Sorrow, which has a bit of Accept mid-tempo in it, it is the first song that falls out of frame, and by now the vocals are starting to bug me. Even if Elvenpath has changed vocalist there is still room for improvement in that department, since the vocals could do with more power in the voice. The vocalist feels uncertain, it is as if he is whispering out the lyrics and has problems with holding a note and furthermore, he sounds too strained. If he only could sing out more, it would do the music more justice. The fast and melodic track Angel Of Fire is true power metal in the best manner, and without a doubt my personal favourite here. It oozes of early Helloween and features some amazing guitars complete with Markus Grosskopf-sounding distinct and playful bass playing, and now the vocals actually work well. Why does he not sing like this all the time? This song is very good and outstanding on this album. The track Northern Son is a tribute to Quorthon of Bathory fame, it is a slow and epic song which, despite the fact that it is very powerful, fails because of the vocals. The song does have a strong chorus, but is borderline cliché, though, and it easily feels a bit too much with this one. Last song to mention will be the instrumental Act The Innocent, this kind of Iron Maiden meets Running Wild turned out very well if you ask me. Elvenpath show good capabilities with the song writing, but some songs could perhaps be better if they were not so lengthy. The band can perform, but even if they should perhaps work on the originality and the vocal department a bit more, there is however still much work left to do.